UC Davis stayed in front of the pack, Eastern Washington and Weber State kept pace, Idaho State kept its unlikely playoff push going while North Dakota’s playoff hopes likely ended. And the two Big Sky Conference schools in Montana won on the same day for the first time since September. No. 6 Davis raced to a 21-0 lead by the end of the first quarter before cruising to a 42-20 win over Northern Arizona to move to 6-o in Big Sky play, 8-1 overall. No. 5 EWU continued the evolution of its style by notching six sacks and three interceptions in a first half shutout of Northern Colorado on the way to a 48-13 win in Greeley to move to 5-1 in league play, 7-2 overall. No. 4 Weber State has struggled to put together a complete game yet likely stamped its playoff resume for the third year in a row with a 26-14 win over Sacramento State to move to 5-1 in league play, 7-2 overall. ISU won a shootout against the league’s two most surprising teams in Portland, moving to 5-1 in Big Sky play, 6-3 overall with a thrilling 48-45 victory at Portland State. The result snapped PSU’s three-game losing streak, dropping the Vikings to 3-3 in league, 4-5 overall and ending Portland State’s already dim playoff hopes. Idaho scored 17 points in the fourth quarter to rally from a 27-17 deficit for a 31-27 win over North Dakota in the first game between the two teams since 2011. Idaho moved to 3-4 in league play, 4-5 overall including 4-0 at home. The loss drops North Dakota, playing as an FCS independent this season, to 5-4 overall. For the first time since September 22, Montana and Montana State won on the same day. 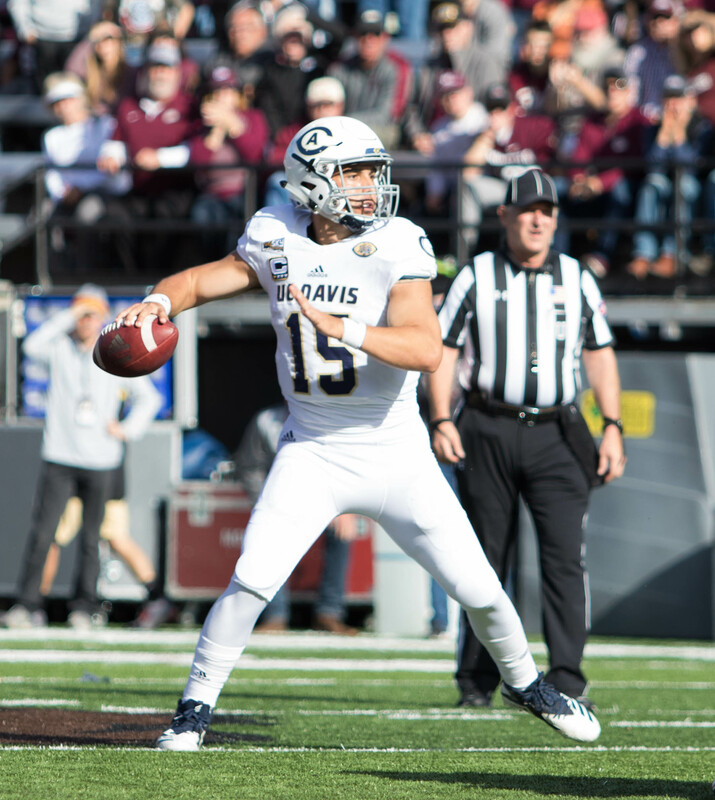 The Griz halted its turnover purge, instead scoring in bunches in a 57-14 win over struggling Southern Utah. Montana State, like the Griz, moved to 5-4 overall, 3-3 in league play with a 49-42 win over Cal Poly. DAVIS, Calif. – Senior running back Tehran Thomas finished with a single-game career-high 24 carries for 94 yards and a pair of scores (another single-game record), while senior wide receiver Keelan Doss caught eight balls for 103 yards and two touchdowns for his 16th career 100-yard performance, leading the No. 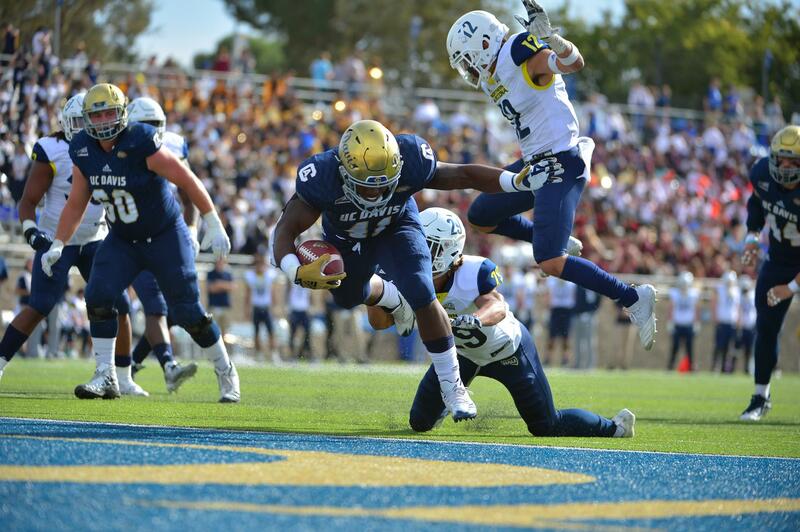 6 UC Davis football team to its sixth consecutive victory, 42-20, over Northern Arizona in a Big Sky Conference battle on Saturday afternoon at Aggie Stadium. Combined with his 56 receiving yards, Thomas finished with 150 all-purpose yards, another career high. The six straight victories for the Aggies (8-1, 6-0 in the Big Sky) are the most in the Division I era and the most since the 2002 squad won seven straight en route to a 9-3 record, snapping a three-game skid against the Lumberjacks dating back to a, 38-24, victory in 2015. UC Davis has scored 40-or-more points in each of its six consecutive victories — the longest such streak since the 2000 squad did so in the first seven games of the season en route to a 12-1 overall record and a trip to the third round of the NCAA Division II playoffs. Northern Arizona, led by 179 rushing yards from quarterback Brandon Porter, fell to 3-6 overall and 2-4 in league play. Defensively, freshman Montell Bland finished with a career-high 11 tackles, including two of UC Davis’ seven tackles for loss, while senior Mason Moe finished with six tackles and his team-high third interception of the season, returning it 37 yards to set up the Aggies’ second touchdown of the day. Junior Jake Maier finished 21-for-33 for 262 yards and three touchdowns, opened the scoring with a 25-yard strike to Doss just 2:19 into the game and capitalized on Moe’s takeaway, finding Thomas for a 39-yard catch and run on the team’s second drive of the day, as the Aggies were off to the races. Thomas punched in his second score of the day on a five-yard burst just before the end of the first quarter for a 21-0 lead, capping a 13-play, 81-yard drive, before Northern Arizona answered to break up the shutout in the second quarter as Cory Young bounced in from one yard out as UC Davis led 21-6, at the break. The two teams traded punts to start the third before senior managerial economics major Namane Modise burst through the line for a 43-yard score, and Doss added his second scoring grab of the day to start the fourth quarter from 16 yards out for a 35-6 advantage. Emmanuel Butler’s 49-yard scoring grab and Porter’s 49-yard touchdown run brought the Lumberjacks to within 15 points late in the fourth before the Aggies capped the scoring, driving 58 yards, on nine run plays, culminating in a bruising two-yard dive by senior biochemistry and C.J. Spencer with 1:13 to play. UC Davis plays on the road for the final time this season next Saturday (Nov. 10), traveling to Cheney, Wash., to take on No. 5 Eastern Washington. Kickoff is scheduled for 1:05 p.m.
Fast starts – and a stingy defense — suit the Eagles just fine. Eastern Washington opened up a 20-0 halftime lead and went on to beat Northern Colorado 48-13 Saturday at Nottingham Field in Greeley, Colo., in the start of three November Big Sky Conference games that will determine EWU’s postseason playoff fate. A week after leading 31-0 at halftime versus Idaho, Eastern pitched another shutout in the first half against the Bears and led 20-0. With the offense piling up 562 yards, the defense had three interceptions and six sacks to hold UNC to 259 yards on the day. Senior D’londo Tucker had two of the interceptions for the Eagles, who have now held all six of its Big Sky opponents to 17 points or less with shutouts in 12 of 24 quarters this season. On a blustery day with sustained winds of 25 miles per hour and gusts of up to 40, Eastern took advantage for a fast start in the first quarter to take a 13-0 lead. The Eagles dominated early with a 169-28 advantage in total offense in the first quarter, and scored after punts of just 27 and 11 yards by the Bears. Sophomore quarterback Eric Barriere accounted for 309 yards of total offense for EWU – 245 passing and 64 rushing. He had one TD pass and a pair rushing. Eastern has now won all 10 Big Sky Conference meetings between the two schools, including all five in Greeley. But the last two times they played Eastern had to rally in the fourth quarter to pull out wins – 35-28 during EWU’s National Championship season in 2010 and 43-41 in 2015. Eastern remained ranked fifth in this week’s STATS NCAA Football Championship Subdivision Top 25 poll and fourth by the coaches. Right behind the Eagles are Weber State (4/5) and UC Davis (6/9). 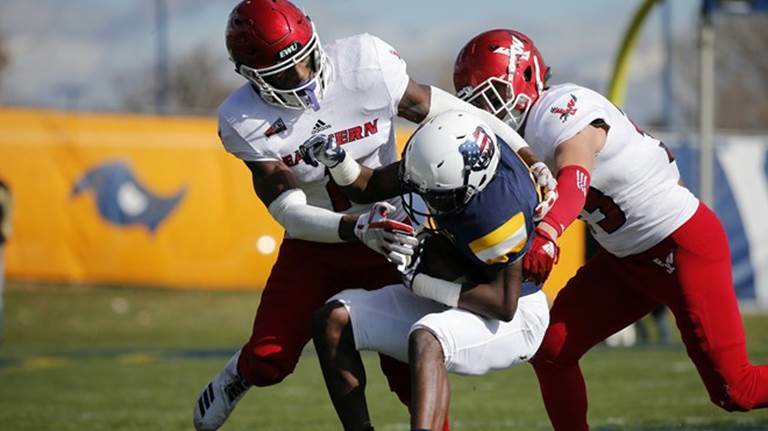 The loss to Weber State knocked Eastern down a bit in the nationally rankings, after EWU equaled its highest rankings in the past four seasons with rankings of fourth and third, respectively. Now 7-2 overall and 5-1 in the Big Sky in 2018, Eastern closed the 2017 season with a 7-4 record overall and was 6-2 in the Big Sky Conference in the first season under Best. This is the 12th-straight season the Eagles will have finished 5-3 or better in the Big Sky, with a 12th-straight winning season and 21st in the last 23 years guaranteed. But winning a 10th Big Sky title and making a 13th appearance in the FCS Playoffs is the quest for the 2018 Eagles, who are hungry to make that happen. The Bears are 2-8 overall and 2-5 in the league, and had won its second-straight game on Oct. 27 with a 42-39 victory at Southern Utah. Northern Colorado also had won 42-14 over Northern Arizona in its last game at Nottingham Field on Oct. 20. Eastern also played NAU, but won only by a 31-26 score. 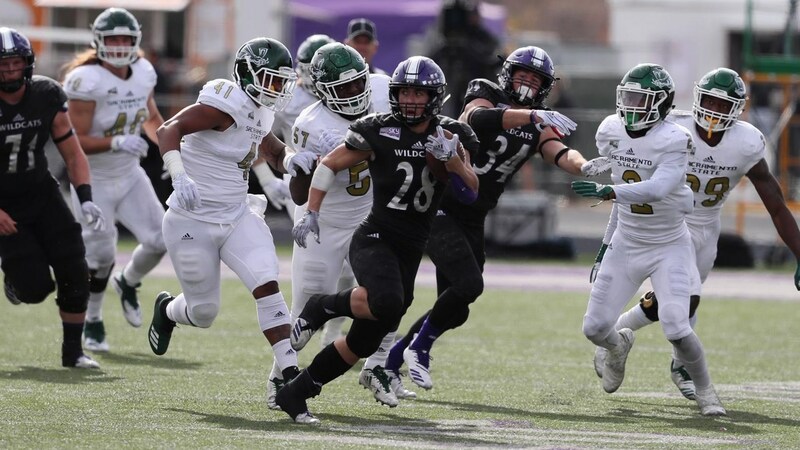 OGDEN – The fourth ranked Weber State football team won its fourth-straight game on Saturday afternoon as the Wildcats defeated Sacramento State 26-14 at Stewart Stadium. With the win the Wildcats improved to 7-2 overall and 5-1 in Big Sky play with two games remaining in the regular season. Weber State has now won seven or more games in three-straight seasons for the first time in school history. The Wildcats also won their eighth straight home game and finished the regular season undefeated at home for just the third time in school history. The Wildcats have won 11 of their last 12 games at home. Weber State jumped out to a 19-0 lead early in the third quarter in Saturday’s win after two Trey Tuttle field goals and touchdown passes from Jake Constantine to Darryl Denby and Rashid Shaheed. Sacramento State recovered a fumble and returned it for a touchdown midway through the third quarter, but Josh Davis responded with a three-yard touchdown run to make it 26-7. The Hornets added a touchdown run with less than a minute to play. The Wildcats held Sacramento State to just 170 yards, the fewest yards allowed by the Wildcats this season. Weber State also held the Hornets to 72 yards rushing and 98 yards passing, while the Wildcat defense finished with 377 yards. Constantine finished the day 23 of 27 passing for 197 yards and two touchdowns and senior Rathen Ricedorff was 3 of 4 passing for 18 yards. Josh Davis had his fifth game of rushing for at least 100 yards as he finished with 18 carries for 129 yards and a touchdown. Davis now has 935 yards on the season. Shaheed led all receivers with six catches for 49 yards and a touchdown. Isiah Jackson had four catches for 61 yards and Denby finished with four catches for 36 yards and a touchdown. Eight different Wildcats caught passes for Weber State. On defense, Jawian Harrison finished with eight tackles, while Parker Preator, Landon Stice, McKade Mitton and Jordan Preator each had four tackles. The Wildcats had two sacks and eight tackles for loss. Saturday’s game was Senior Day, as Weber State honored its 16 seniors in the final regular season home games. 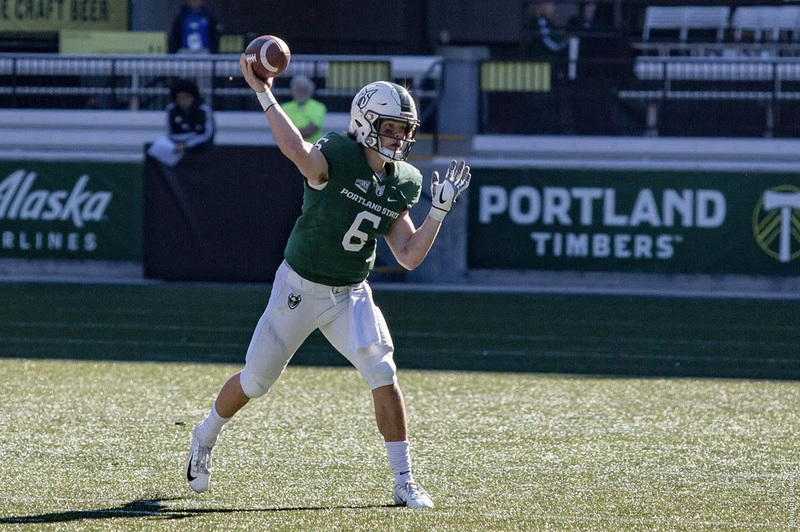 Hillsboro, OR – A Portland State comeback ran out of time as the Vikings lost to Idaho State in an offensive showcase, 48-45, at Hillsboro Stadium. Trailing by 10 points in the fourth quarter, the Vikings scored a touchdown with just over three minutes remaining, then got the defensive three-and-out they needed. PSU started its final drive at its own 12-yard line with 2:31 to play and no timeouts. The Vikings’ final march included a fourth-and-nine conversion pass from Davis Alexander to Emmanuel Daugbe. Later, on third-and-21 play Alexander made a 20-yard completion to Charlie Taumoepeau. The officials marked the play just short of a first down at the ISU 36 and the Vikings had to race to get a final play off. But the scramble to snap the ball with the clock running out ended as a sack. The loss for the Vikings ended a three-game winning streak and dropped their record to 4-5, 3-3 in the Big Sky Conference. 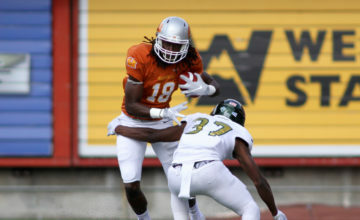 Idaho State improved to 6-3, 5-1 in the Big Sky, and kept playoff hopes alive. PSU had 597 yards of total offense to 518 for Idaho State. “We grew up tonight. I saw some kids make some big plays and we were resilient. The offense picked up the defense tonight. 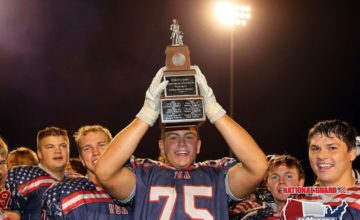 It had been the other way around earlier this year,” said Viking Coach Bruce Barnum. Idaho State took the opening drive 79 yards, benefitting from a fourth-down penalty by the Vikings midway through. The Bengals went for it on a fourth-and-one play from their own 49-yard line. Tanner Gueller attempted a quarterback sneak but the snap was fumbled. However, the Vikings were ruled as being offsides, extending the drive for ISU. Later Gueller hit brother Mitch on a 23-yard touchdown pass and the Bengals had the early lead. A 54-yard run by Carlos Martin highlighted the Vikings’ opening drive. The Bengals were able to hold inside the 20 though as PSU settled for a 30-yard field goal from Cody Williams. Late in the quarter Gueller found Michael Dean on a 63-yard touchdown pass. The gave the Bengals a 14-3 advantage at the end of the first quarter. Portland State came back to tie the game 17-17 with a pair of early second-quarter touchdowns. Darian Green caught a 44-yard touchdown pass from a scrambling Alexander on a broken play. Then, a few minutes later Alexander sprinted to the right pylon from 10 yards out. His touchdown was set up by a 47-yard flea flicker pass to Mataio Talalemotu. Dean had his second long touchdown catch later in the second quarter, a 28-yard grab from Gueller, and ISU went back ahead 24-17. Again the Vikings responded with a score. Alexander led a 12-play, 73-yard drive that chewed up 6:22 on the clock. He hit Emmanuel Daigbe on a nine-yard, back shoulder throw in the left corner of the end zone. Again, the game was tied at 24. But the Gueller brothers had one last score in them before halftime. Tanner connected with Mitch on three straight passes. The last was from 12 yards out and the Bengals went up 31-24 with 40 seconds left in the half. As expected, the offensive numbers were impressive at halftime. ISU had 333 yards and Tanner Gueller had thrown four touchdown passes. PSU had 305 yards at halftime while Alexander had thrown for two scores and run for a third. Portland State tied the game for the third time when they opened the second half. PSU had the opening series and Alexander led the way, scoring his second rushing touchdown. His eight-yard run knotted the score at 31-31. A 21-yard pass to Ty Flanagan on a fourth-and-eight play from the Viking 26-yard line set up yet another go-ahead touchdown for the Bengals. On the next play, Tanner Gueller broke through the line on a five-yard TD run. On his first touch of the game, Antwone Williams made a big play for the Vikings. He broke away on a 54-yard touchdown run and again the score was tied at 38-38. Just before the end of the third quarter, the Bengals went back ahead 41-38 on a 27-yard Campbell Sheidow. The Bengals got a big break on PSU’s next series. The Vikings drove to the ISU 30 but were forced into a field goal attempt. Williams’ effort from 47 yards had plenty of distance but hit the right upright. From there, Idaho State finally got a two-score separation. The Tanner-to-Mitch Gueller connection featured a 45-yard play in a 70-yard scoring drive. Ty Flanagan eventually scored on an eight-yard run and ISU led 48-38 with 10:27 to play. Portland State battled to stay in the game though. A lengthy 13-play, 78-yard drive pulled PSU within 48-45 with 3:06 to go. Alexander converted a fourth-down with a five-yard completion to Carlos Martin. Then, Jacob Bystry made his biggest play of the season with a 34-yard reception. Alexander later scored on a three-yard run. On Idaho State’s ensuing drive, the Vikings got their defensive stop and a punt. That set up the frantic closing drive for PSU that came up short. Alexander threw for 273 yards and two touchdowns and rushed for 64 yards and three scores. The Vikings also got a career-high 105 rushing yards on 10 carries from Carlos Martin. PSU gained a total of 316 yards on the ground on 49 carries, an average of 6.4 yards per carry. ISU was led by Tanner Gueller, who finished 15 of 30 for 344 yards and the four TDs. His brother Mitch caught six passes for 144 yards and two scores, while Dean had five catches for 152 yards and two scores. MOSCOW, Idaho – Mason Petrino found Jeff Cotton in the corner of the end zone for the go-ahead touchdown with 27 seconds to play, lifting Idaho to a 31-27 win over North Dakota Saturday, at the Kibbie Dome. The Vandals (4-5, 3-4 Big Sky) scored 17 points in the fourth quarter, including a blocked punt returned for a touchdown. Idaho took possession on its own 43 with 2:45 remaining, trailing 27-24. After Petrino connected with David Ungerer to move the sticks on a fourth down play and again on a third and short, the Vandals were inside the 10. Two plays later Petrino took advantage of one-on-one coverage against Cotton on the outside, hitting the fade route in the back of the end zone for an eight-yard touchdown and the game-winning score. Cotton set career highs with 10 receptions and 137 yards, his second consecutive game cracking the 100-yard mark. Petrino finished with 277 passing yards and two touchdowns on career highs of 27 completions and 50 attempts. The Vandal defense registered eight tackles for loss, including four sacks, led by D.J. Henderson’s two sacks and four tackles for loss. 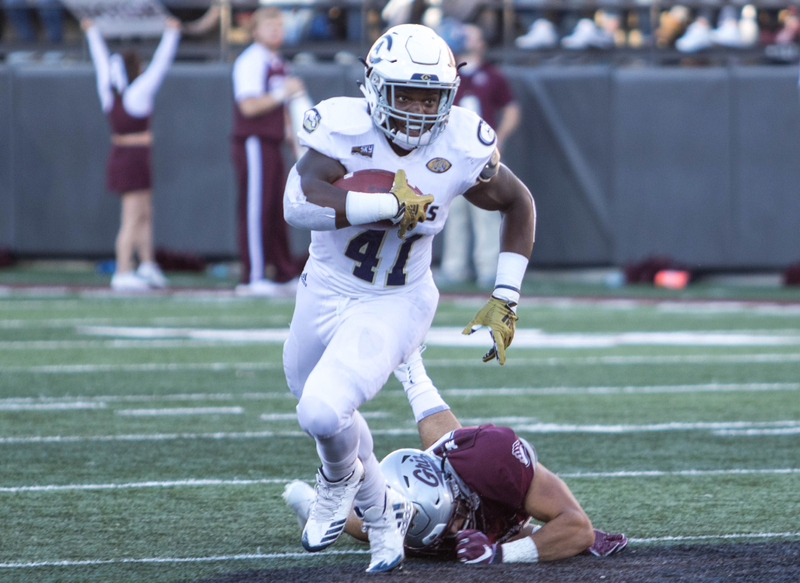 Lloyd Hightower recorded three of Idaho’s seven pass breakups, while Denzal Brantley – Idaho’s leading tackler with eight stops – pulled down his first interception. North Dakota (5-4) entered the week ranked No. 25 in the AFCA FCS Coaches’ Poll. It is Idaho’s first win since 2007, over a team ranked in either poll (media or coaches) in either the FCS or FBS. The Vandals improved to 4-0 at home and will have a chance to finish with a perfect home record next week against Montana. Idaho’s last season without a home loss was 1996. Kickoff is slated for 3:30 p.m. Saturday (Nov. 10), and will be televised on ROOT Sports. Idaho struck first with a 43-yard touchdown run by Isaiah Saunders on the Vandals’ second possession of the game. It was the longest run of Saunders’ career and the longest by a Vandals this season. 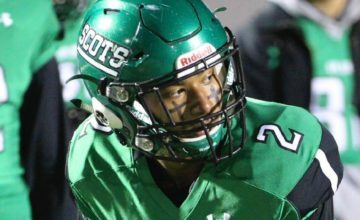 The senior running back finished with 94 yards on 17 carries, eclipsing the 2,000-yard mark for his career. The Fighting Hawks got on the board in the first quarter with a long run of their own. Brady Oliveira went 68 yards down the sideline to tie it up. Idaho answered right back with a six-play, 75-yard drive in 2:22, capped by a 10-yard pass from Petrino to Ungerer to put the Vandals back on top before the end of the first quarter. An Idaho fumble set North Dakota up with a short field early in the second quarter. It took 12 plays to go 36 yards, but eventually a four-yard touchdown pass evened the score at 14. That’s where the score remained headed into halftime. The Fighting Hawks took their first lead of the game with 2:19 remaining in the third quarter on a three-yard touchdown run by Oliveira, but the extra point sailed wide. The fourth quarter began with a 24-yard field goal from Cade Coffey to bring Idaho within three points at 20-17. North Dakota needed just five plays to find the end zone again and extend its lead to 10. The defense stood tall twice more before the offense put its game-winning drive together. With a lead to protect once again, Charles Akanno recorded two sacks on North Dakota’s final drive, including the final play of the game.